Directed by Brad Peyton. Produced by Beau Flynn, Hiram Garcia, and Tripp Vinson. Written by Carlton Cuse. Release date: May 29, 2015. 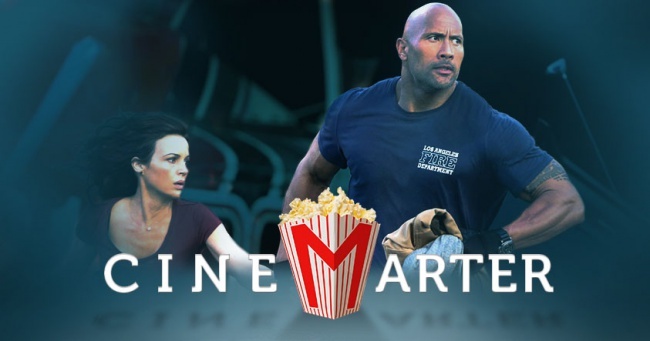 Essentially Earthquake, but set in 2015, San Andreas is a disaster movie in which a series of earthquakes go off, destroying much of California in the process. The disaster happens Roland Emmerich-style, with big set-piece CGI scenes depicting all of the destruction, and the film follows three different groups as the earthquakes strike. If you've seen 2012, and you wanted a shorter, more focused version of that, then San Andreas is your movie. 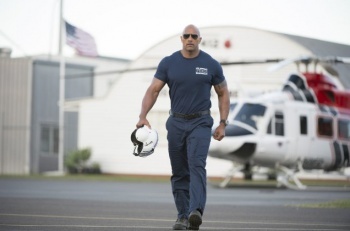 The three groups are as follows: (1) Ray (Dwayne Johnson), a rescue-helicopter pilot, and his estranged wife, Emma (Carla Gugino), who head from Los Angeles to San Francisco to rescue their daughter, Blake (Alexandra Daddario). (2) Blake and a couple of tourists, Ben (Hugo Johnstone-Burt) and Ollie (Art Parkinson) try to find high ground while waiting to be rescued. (3) Lawrence (Paul Giamatti), a Caltech professor, finds a way to predict earthquakes and then, with the help of a reporter (Archie Panjabi), tries to warn everyone about the impending disaster. If you want to include a fourth group, it would be the numerous explosions, falling buildings, crashing waves, and other ways to destroy things - most of which are accomplished with pretty decent CGI. San Andreas doesn't shy away from its fair share of genre clichÃ©s. Just some of them include: the "new" guy (Ioan Gruffudd) turning out to be a bit of a jerk; the disaster bringing the main family closer together; millions of lives being lost and ignored because, if they're not part of the main cast, they don't matter. Seriously, outside of a couple of brief moments, Ray winds up ignoring the pleas for help of a ton of people, instead focusing on his singular mission. The idea is that we are given a family to root for and give us hope. The problem with that is that none of the characters are particularly interesting. Ray and Emma lost their other daughter years ago, which is about the only characterization they're given. Blake knows how to survive thanks to her father, but otherwise exists to be rescued. Ben is a love interest, Ollie is comic relief, and Lawrence is the one to deliver exposition. They fill stock roles and achieve little else. The dialogue is also hilariously bad, but those who love disaster movies are probably going to be pleased to hear that. These movies function more as guilty pleasures than as genuinely thrilling entertainment for a lot of people, and the bad dialogue is part of the joy.